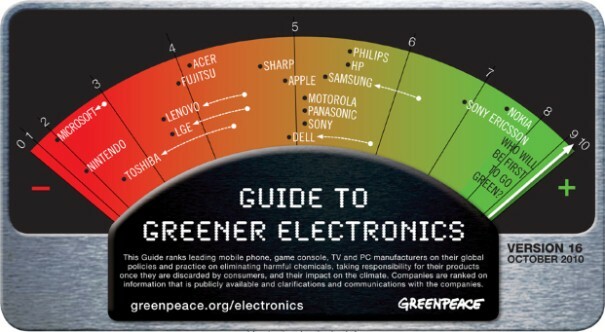 Greenpeace have just released their annual Guide to Greener Electronics. This excellent publication helps those of us who want to be more green to encourage greener companies with our gadget purchases, and avoid those who are falling behind in their eco-friendliness, or worse still, indulging in "Greenwash". The guide ranks the 18 top manufacturers of personal computers, mobile phones, TVs and games consoles according to their policies on toxic chemicals, recycling and the climate impacts of their operations. Philips are this year's biggest mover, as their new Econova TV is the first on the market to be free of polyvinyl chloride (PVC) and brominated flame retardants (BFRs), putting it well ahead of other TV manufacturers. Top scorers were Nokia, remaining in first place, and Sony Ericsson stayed at second. The Econova TV help Philips keep its third place despite competition from HP, which moved up to fourth. Some Brominated Flame Retardants, used in circuit boards and plastic casings, do not break down easily and build up in the environment. Long-term exposure can lead to impaired learning and memory functions. They can also interfere with thyroid and oestrogen hormone systems and exposure in the womb has been linked to behavioural problems. PVC is a plastic used in some electronics products and for insulation on wires and cables. Chlorinated dioxins and furans are released when PVC is produced or disposed of by incineration (even burning). These chemicals are highly persistent in the environment and many are toxic even in very low concentrations. 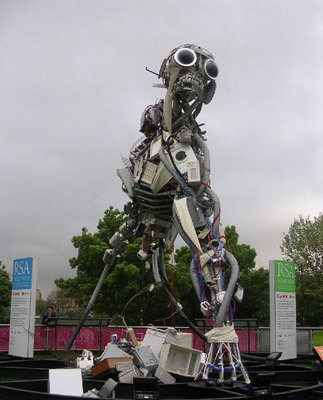 Much of Europe's e-waste is sent to third world countries and disposed of in environmentally unsound ways, like simply burning it. Lots of new products are now coming on the market free of these contaminants. In contrast, Toshiba, LGE, Samsung, Dell and Lenovo still have no whole PC product lines free from these substances. Toshiba is served a second penalty point in the Guide this year for misleading its customers about its commitments and a first penalty point is imposed on Microsoft for backtracking on commitments to remove these toxic substances. Several other companies continue to be weighed down by penalty points for failing to meet their phase out commitments, including LGE, Samsung, Dell and Lenovo. Apple takes the biggest drop, not because it has lost any points but because several other companies have overtaken it. LGE and Toshiba, both previously amongst the leaders, now take 14th and 16th place, showing that in this fast moving and innovative sector that standing still is just not good enough. As Christmas is coming up, and it is the season of goodwill and consumerism, if this blog's readers are going to buy an electronic item this year, they should try to aim to reward those companies who are trying to green their products by buying them.